Participants of the second Regional NSRG WFN meeting. From left to right: Marina Alpaidze, MD, President of NSRG WFN Georgian Chapter and President of Georgian Society of Neurosonology and Cerebral Hemodynamics; Alexander Razumovsky, PhD, FAHA, Secretary of NSRG WFN (U.S.); Natan Bornstein, MD, PhD, Vice-President of World Stroke Organization, President of European Society for Neurosonology and Cerebral Hemodynamics (Israel); and Ekaterina Titianova, MD, PhD, Dsc, President of Bulgarian Society of Neurosonology and Cerebral Hemodynamics. During Oct. 25-26, 2014, the Georgian Chapter of the NSRG WFN successfully conducted the second NSRG WFN Regional Meeting in Tbilisi, Georgia. There were also participants from neighboring countries — Armenia and Azerbaijan. This two-day course was designed for individuals who are interested to perform and interpret neurosonology studies. The faculty discussed current status of neurosonology and some specific clinical applications; part of the meeting was dedicated to the hands-on practice. 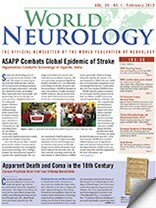 The lectures were delivered by well-known neurologists and neurosonology experts such as N. Bornstein (Israel), E. Titianova (Bulgaria), Z. Nadareishvili (U.S.), M. Alpaidze (Georgia), and A. Razumovsky (U.S.). 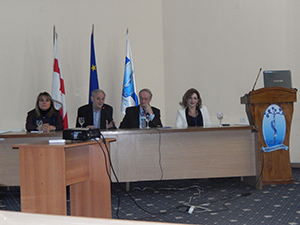 This second Georgian meeting was guided and directed under the auspices of the NSRG of the WFN and accredited by Tbilisi Medical University Continuing Medical Education (CME) Board for 10 CME hours. Dr. Alpaidze is the Head of Ultrasound Laboratory, DEKA Medical Centre, University Clinic Department of Neurology, Tbilsi, Georgia.